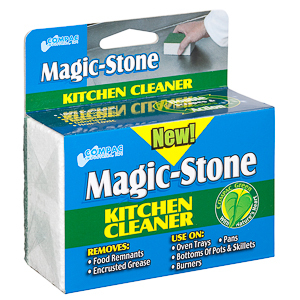 The Magic Stone Grill Cleaner is an exciting new scrubbing block designed to easily removed encrusted grease and dirt. Use the Magic Stone on grills, oven griddles, BBQs, and other steel and iron kitchen utensils. Remove cooked on grime and grease with little effort. 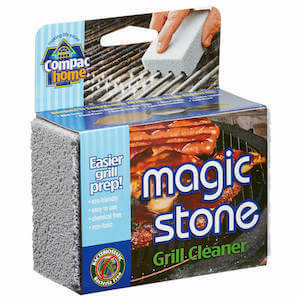 Take the hard work out of cleaning your grill with the Magic Stone Grill Cleaner. Be sure to check out the Magic Stone Grill Cleaner Handle! Receive an additional discount when you share on Facebook! WHAT MAKES MAGIC-STONE SO SPECIAL? MAGIC STONE is made of only transparent, flat window in pure glass, in order to avoid dangerous substances like lead, arsenic, cadmium, and others that may contain recycled bottles or waste glasses. All cellular glass products are made from recycled glass. Other manufacturers may use recycled glass from chemical or pharmaceutical industries or use recycled glasses, which were chemically tinted or treated to contain acidic or corrosive substances. As such, the final product may contain these types of dangerous substances. 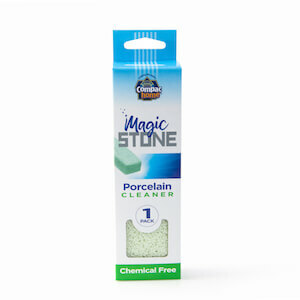 MAGIC STONE offers a complete range of products with closed cells. As a result, microorganism (bacteria, fungi) cannot live in them, reducing the probability of causing several serious infections. Our products do not absorb liquids or vapors. Our cellular glass products have been tested with bacteria like Escherichia coli, Staphylococcus aureus, Aspergillus niger, Candida albicans, and others, that either disappear or can not live in our products. In a recent test of products similar to MAGIC STONE, other items had water absorption of around 26% (after two hours of use). As the stone cannot be squeezed, the water penetrates into the stone. As a result, bacteria and fungi can live inside with risk of infections. Our MAGIC STONE Pool Cleaner, like all the products of our range (including the MAGIC STONE Grill Cleaner) has absorption of less than 5% (only on the surface, not inside the stone). No bacteria or fungi can live in it! Product that is too hard, which may deeply scratch surfaces, etc. MAGIC STONE has constant, high quality, specific densities and hardness for each use, thanks to over 50 years of experience in the manufacturing of cellular glass. This experience is another reason to select MAGIC STONE.